Book any of our sound system packages, and get 10% off the price of any lighting equipment you hire!! This system is perfect, if you already have your own decks (cd/vinyl) and a mixer. 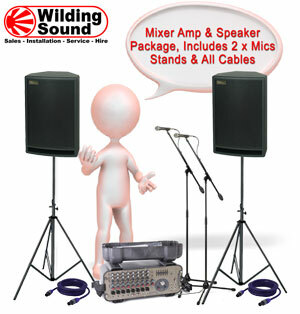 The system includes a 500W amplifier, 2 Deltec SX2 speakers (1x12" Bass Mid and HF), tripod speaker stands, and all leads, including the leads from your mixer to our amp. 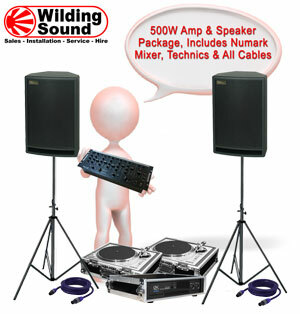 Again, designed so you plug your decks and mixer into our amps and speakers. 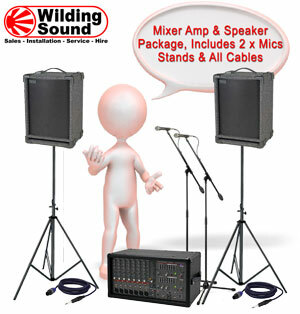 This system features a stereo 500W amplifier, 2 Deltec MX3 speakers (1x12" 400W bass mid, Compression driver HF), tripod speaker stands, and all leads, including the leads from your mixer to our amp. This system is designed to accept an input from your iPod or laptop, and includes a mic for those important words, "the buffet is now ready". 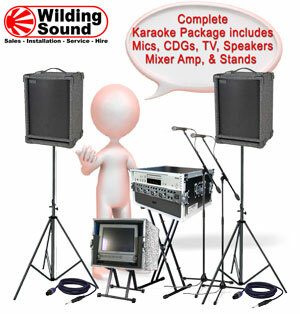 It includes a Phonic PowerPod 740, 440W RMS mixer/amplifier, a pair of Deltec SX2 1x12" + HF Speakers, tripod stands, and all leads, including the lead from your iPod or laptop headphone-out-socket. We use a special lead for laptop connection, which eradicates the background hissy/crackly noises created by some laptop power supplies. This system is designed to accept an input from your iPod or laptop, and includes a mic for those even more important words, "the bar is now open". 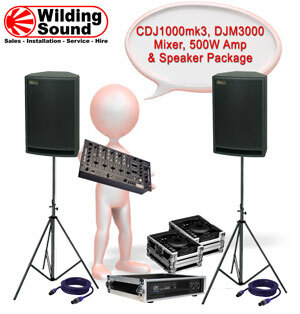 It includes a SoundCraft GigRack600, 2x300W RMS mixer/amplifier, a pair of Deltec MX3 (400W RMS, 1x12" + Compression Driver) Speakers, tripod stands, and all leads, including the lead from your iPod or laptop headphone-out-socket. This popular package is suitable for professional and domestic use. It features a flightcased 14" colour monitor, a further flight case housing the Denon CDG player, the mixer amplifier, and a useful draw. This holds the request slips, and the all important track listings booklets. Also included is a pair of Deltec SX2 225W 1x12"+HF Speakers, on tripod stands. 2 Mics, Shure SM58s, are included, along with mic stands. The supplied CDg discs cover pretty much all popular karaoke tracks from Elvis to the Spice Girls, check out the track listings below! The Deltec MX3 has a higher grade 12" bass-mid driver, than the SX2, and a proper compression driver for HF. Industry Standard for playback of vinyl, the Technics SL1210mkii (black) and the SL1200mkII (silver) have been the preferred decks for turntablists for decades. Our package of two turntables, comes with a Numark CM200 mixer, 500W stereo Power Amplifier, Deltec SX2, 1x12" Bass Mid + HF, 225W RMS speakers, a pair of tripod stands, and all leads for full operation. The technics come with Stanton Carts and Styli, and a spare styli is included, on sale or return, to get you out of trouble if the worst happens. Our package of two turntables, comes with a Numark CM200 mixer, 500W stereo Power Amplifier, Deltec MX3, 1x12" Bass Mid + Compression DriverHF, 400W RMS speakers, a pair of tripod stands, and all leads for full operation. Compact and easy to use, the Numark CDN450 twin CD player reads traditional CDs and MP3 burnt on CDS. 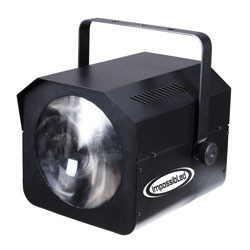 It offers seamless looping, antishock playback, along with scratch, pitch/speed control and key lock facilities. 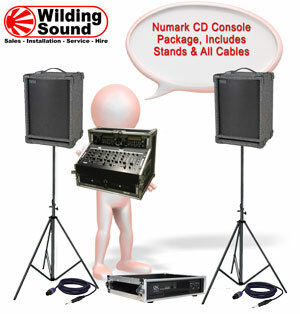 All prewired in a dedicated flight case, the console also features a Numark CM200, 5 channel DJ mixer. This package also includes a 500W stereo power amplifier, a pair of Deltec SX2, 1x12" + HF, 225W RMS speakers, with tripod stands. All leads are included, and you can also plug in iPods, laptops and turntables via the custom, rear easy access panel. All prewired in a dedicated flight case, the console also features a Numark CM200, 5 channel DJ mixer. This package also includes a 500W stereo power amplifier, a pair of Deltec MX3, 1x12" + Compression DriverHF, 400W RMS speakers, with tripod stands. 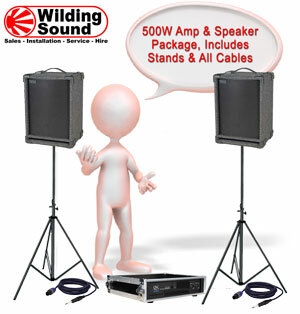 This system is perfect for quiz nights, open mic nights, and simple conferences. The Phonic PowerPod 740 has 4 dedicated mic inputs, with 3 band eq, aux send and rev send. A further 3 inputs also accept either microphones or feeds from iPods, Laptops, CD players, or other line level sources. It also features a built-in digital reverb. Extra mics, including our new range of, fully OFCOM/JFMG licensed Ch38 Shure SLX radio mics are available as extras, please ask for more details. 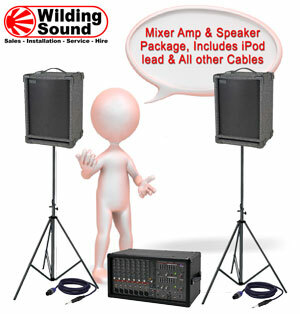 This system includes a pair of Deltec SX2, Compact, 1x12" Bass-Mid and HF, 225W RMS speakers, tripod speaker stands and all leads, including any needed for plugging in your iPod or laptops. The SoundCraft GigRack600 has 4 dedicated mic inputs, with 3 band eq, aux send and rev send. A further 4 inputs also accept either microphones or feeds from iPods, Laptops, CD players, or other line level stereo sources. It also features a built-in digital reverb. This system includes a pair of Deltec MX3, Delux, 1x12" Bass-Mid and Compression Driver HF, 400W RMS speakers, tripod speaker stands and all leads, including any needed for plugging in your iPod or laptops. The ColorStrips replace our autolights, but do so much more. They can be used like an autolight, as a flashing traffic light effect, with these lights auto synching to sound from there built in microphone. Multiple units data link to each other for a co-ordinated lightshow. 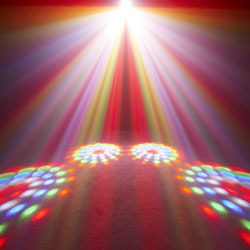 They can also be used as uplighters, to colour your walls with bright vibrant light. This can be a slow fade between different colours, or can be pre set to any one colour. Becuse of thier low power consumption, up to 15 can be safely connected to one 13 Amp plug top, making power distribution a breeze. A pair of these ColorStrips, including 5m Mains Power lead, 10m Data link lead, 10m Power link lead, flightcase and programming instructions cheat sheet hire for £39 inc VAT per day. We have recently added a number of Acme ImpossibLED to our hire fleet, after succesfully selling a huge number to our customers to rave reviews. The are very easy to use, having a built in microphone to react to sound, and multiple units can be linked together using a dmx cable. 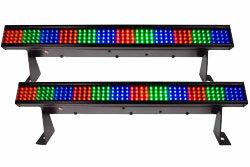 These units are some of the first LED units that are bright enough to be seen in smoke, rather than just projected onto a surface. Given there low energy requirements, and LED's long life, they are also considerably greener than older Halogen lamps. They are also safer, as they are considerably lighter than equivalent units, and generate very little heat. This lack of heat means no fans, so are quieter too! This package includes both an Impossibled, on a tripod stand, and two ColorStrip Minis. The package includes all leads required. 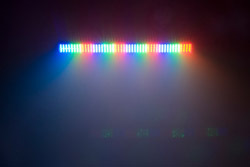 All the lights respond to sound, from built in Microphones. By ordering them together as one package, you save £15! !